It is difficult to do photographic justice to these two Giants! 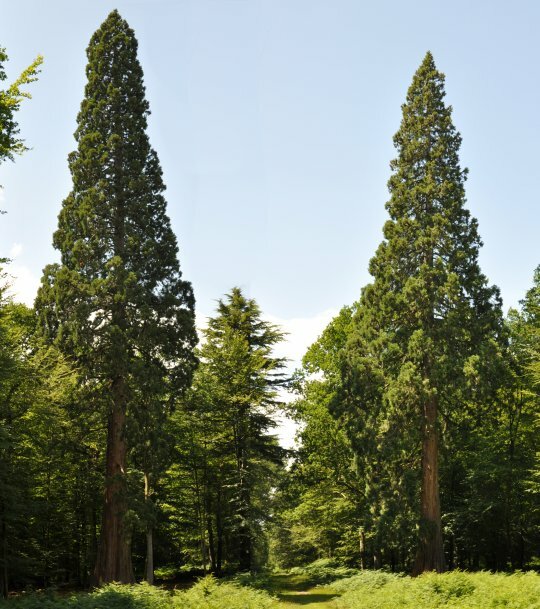 If you like Wellingtonia, take a trip deep into the New Forest to visit them - they can be found on the Tall Trees Trail Rhinefield. 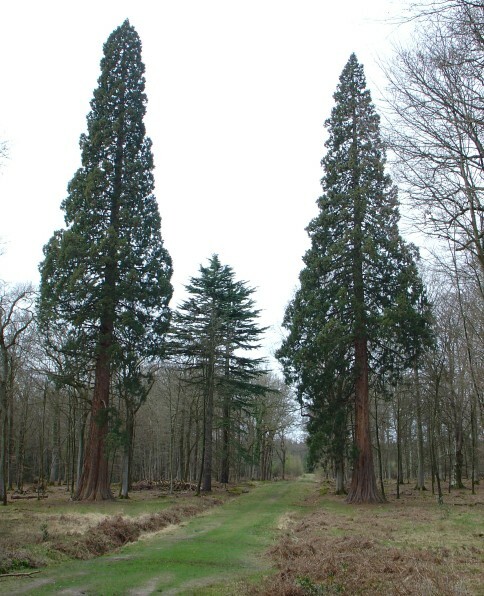 The pair are reckoned by the forestry commission to be the tallest trees in the forest - of this there can be little doubt. They are huge. It is difficult to truly appreciate their height from the photograph, but with the full height of the tree in the picture, a person stood next to one would scarcely be noticed - and would definitely not be recognised. They were planted around 1860, and have survived to this time relatively unscathed. They have no signs of lightning or wind damage, it is probable that being in a forest has protected them from the elements to some degree. 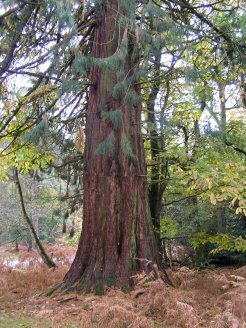 There is also an example of Coast Redwood (Sequoia sempervirens) a few moments walk away. 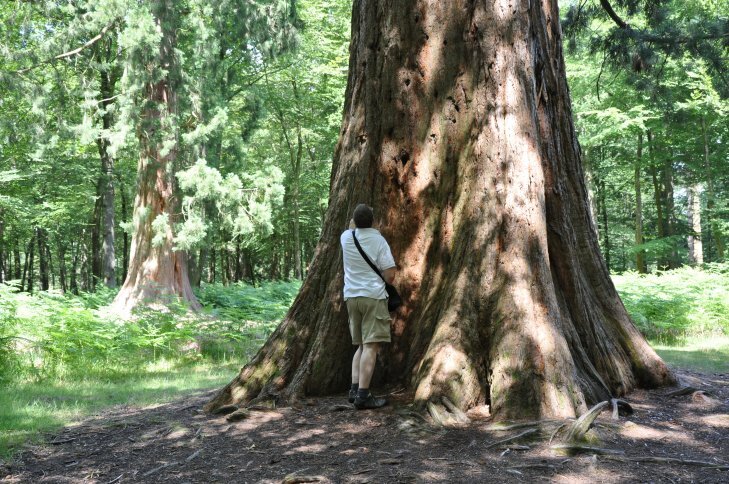 It is interesting to compare this with the Giant Redwood (Sequoiadendron giganteum) - it is quite big (5 metres in girth), but it is too crowded to be able to appreciate its height. 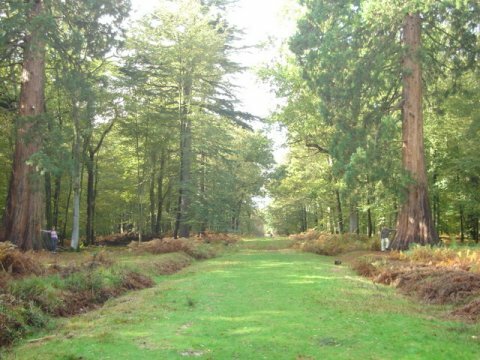 Further along the Rhinefield Road there is an area of mixed conifers where the ground is covered in Coast Redwood saplings of 10cm or so high, seeded from the larger examples nearby. Thanks to Luke for providing the photographs (above and below) of his trip to the New Forest. These pictures all include people standing next to the trees as a comparison for size but you really have to visit them yourself to appreciate how very big they are. 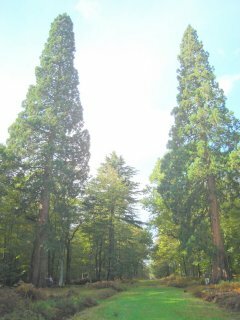 As mentioned above, in pictures showing the full height of the trees, it is difficult to spot the people next to the them (the bottom left picture). 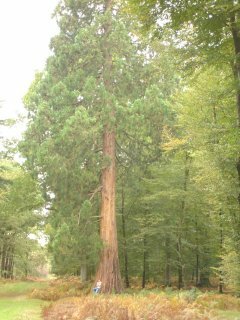 Radek sent the photographs below of two more Giant Sequoia on Rhinefield Road. He says "I did not have any tool to measure them but I would estimate number 1 to be 30 m - 35 m and number 2 to be 40 m – 45 m."
Thanks Radek, unfortunately I must have missed them when I was there some years ago, I obviously spent too long admiring the others! 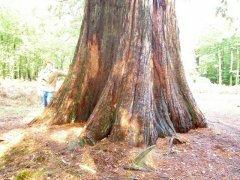 During a visit in 2010, I believe I found the two additional Giant Redwoods mentioned by Radek, these are included as numbers 9 and 10 in the table below. 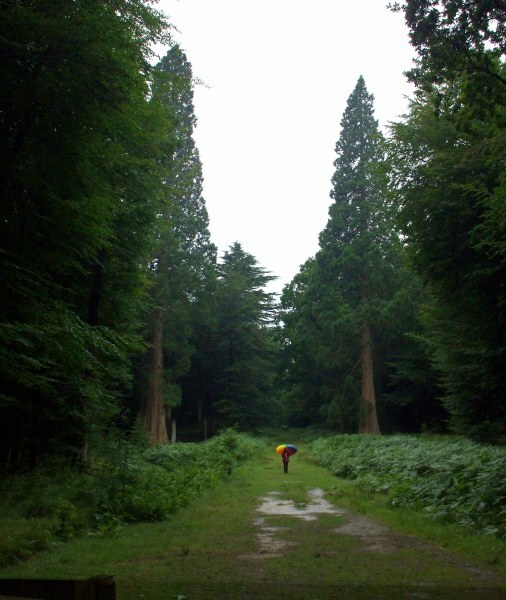 Also discovered were two Dawn Redwood, another younger Giant and two Coast Redwood in the Arboretum (numbers 4 to 8). This visit was also an opportunity to re-measure the two champion Giants. They measured up at an amazing 52.73m and 48.5m! I believe these to be pretty accurate records of their heights, obtained using a precision clinometer (not a professional grade device but certainly very accurate) and taking great care to allow for differences in base height. They had also grown in girth since the last measurement in 2005. 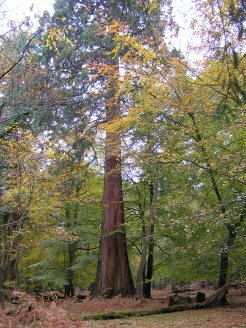 Both trees have increased in height and girth by roughly two to three percent during the five year period, although a different and slightly less accurate instrument was used to measure the heights in 2005. In fact one of the reasons for this return visit was to reaffirm the highest one as being the tallest in the U.K.
"A friend and I used to climb this tree in 1939 whilst on our apprenticeship for Forestry in New Forest during our lunchbreak. It took 10 minutes to climb to the top where we could see the Isle of Wight and surrounding areas. Branches went right down to the ground in those days! " Many thanks for your email and it was really good to hear about your climbing exploits whilst on your apprenticeship in 1939. It is fascinating that it only took you ten minutes to climb to the top in those days, whereas nowadays it would take a lot longer! This photograph is of Mary and her colourful umbrella! It was taken in August 2014 when she visited the Tall Trees Trail. 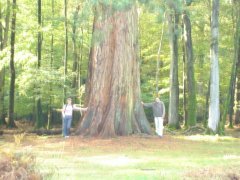 Mary also told us about a couple of Giant Redwood in Stoke Sub Hamdon.